© and published 2014 by Koch Media GmbH, Gewerbegebiet 1, 6604 Höfen, Austria. Deep Silver is a division of Koch Media GmbH. 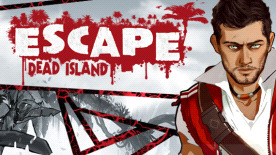 Deep Silver, Dead Island, Escape Dead Island and their respective logos are trademarks of Koch Media GmbH. Developed by Fatshark AB. Fatshark AB and its associated logo are trademarks of Fatshark AB. All other trademarks, logos and copyrights are property of their respective owners. All rights reserved.